New digital signs in the Tokyo railway system are noting the age and gender of those who look at them. Personalized ads are moving towards the real world. Be careful if you’re riding the trains around Tokyo this summer, the billboards may be watching you. A consortium of 11 Japanese railway companies have teamed up with marketing researchers to determine who looks at electronic advertisements. This ‘Digital Signage Promotion Project’ uses cameras mounted near the computerized billboards to record the approximate age and gender of those who turn their faces towards any of 27 signs spread through the railway system. 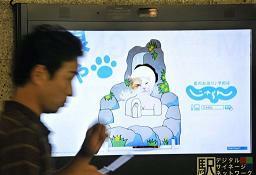 According to the Daily Yomiuri Online, the project started on the 21st of June of this year and aims to give researchers a better understanding of the demographics of those that pay attention to railway advertisements. It’s a cool idea, but I find the concept of ‘smart ads’ pretty disturbing. It’s not the mild invasion of privacy that has me worried. For the record, the Digital Signage Promotion Project is for broad data analysis only. There is no intention of using the images of individuals faces. Our appearances are recorded when we’re in public all the time anyway. No, what gets me nervous is the idea that advertisements will start to ‘know’ things about me. On one hand I can appreciate this as pretty cool. I mean, computer vision can approximate age and gender now…that’s neat. And I’m a little impressed with how well ads can be shaped to customer behavior. I always get tickled when ads in my web browser offer me something I was searching for earlier, or when Gmail uses the words in my emails to suggest products (no, I really don’t want to eat spam, Google). But I’ve trained myself to ignore ads on the computer. Doing so in the real world might be more difficult. That’s probably the point. Yet there are ways to make digital signage less aggressive and still draw people in. For instance, we recently saw a building in Tokyo that used matrix codes to allow people to see what those inside were tweeting. In other words, those passing by the building had a choice to pursue more knowledge, but weren’t forced to look at something they didn’t want to see. Even if you did want to go big and flashy, you could avoid targeting individuals and work on crowds. Large digital projectors, which we’ve seen before, can turn the side of a building into an enormous canvas for electronic art. Scan a crowd for average age and gender, and you could swap out different ads to fit the group as a whole. The true nightmare scenario (in my opinion) would arise when digital ads can recognize and address us by name (as seen in a clip from Minority Report below). Having a billboard shout your name and try to sell you something is horribly invasive and unsettling. The Digital Signage Promotion Project isn’t getting us there yet…but it seems like just a matter of time. Give it a few years and digital signs on the train may start offering me a personalized spam sandwich. Blegh.